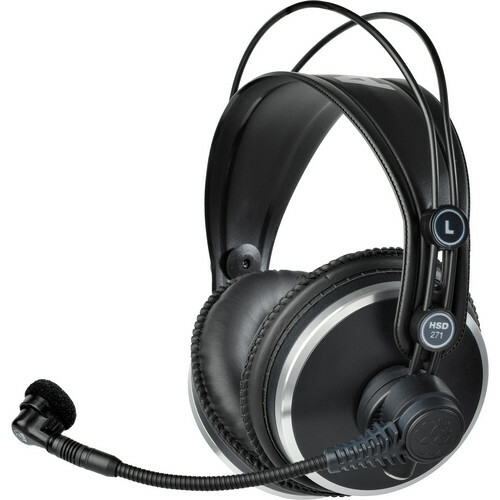 The HSD271 Professional Headset from AKG is an over-the-ear, closed-back design with a rugged dynamic microphone intended for intercom, ENG/EFP work, recording, and video production. The flexible microphone arm mutes the microphone automatically as it is moved up. The boom microphone can be mounted to the left or right side, depending on personal preference and available space to deliver a frequency response of 16 to 28,000 Hz with a sensitivity of 104 dB/V into a 55 Ohm load. This unit features a switch on the headband that mutes the audio as soon as the headphones are taken off. The 6-pin mini XLR connector is detachable which allows for a variety of cabling options for different applications as well as quick replacement of a broken cable. Please note that the headset is supplied without a connecting cable. Please order the appropriate connecting cable separately. Box Dimensions (LxWxH) 9.1 x 8.9 x 4.4"